Full rotary technology combined with variable repeat length allows printing at maximum speed, regardless of the size of the labels. You can print labels of different formats and sizes in the same run. Our Roll2Roll digital labels are manufactured using our Xeikon presses and are capable of printing onto a wide range of substrates. We utilise CMYK process colours that can be varnished or laminated for use in harsher environments. Additionally we also offer the option of printing an opaque white, perfect for backing illustrations on clear materials and providing crisp registration and smooth tones. Labels are able to be supplied on a roll or in single format. 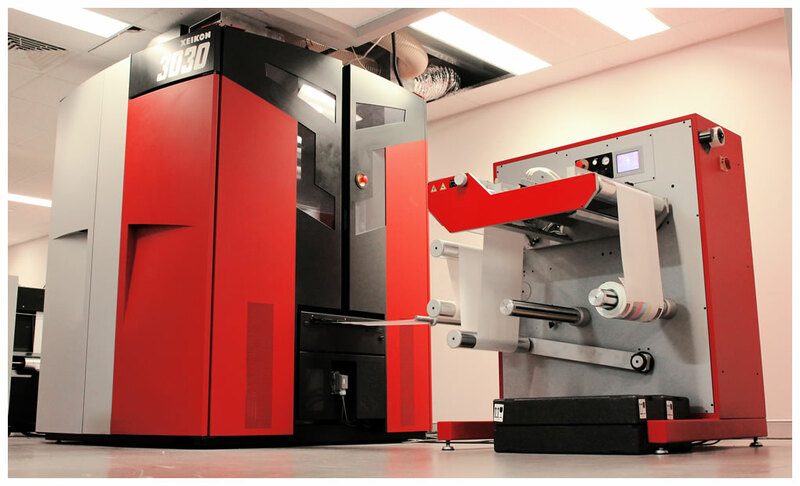 Xeikon is one of the most environmentally friendly digital presses in the business and they focus heavily on innovation, as do we. Using the Xeikon digital print technology, Guru Labels are considered leaders in the Australian digital marketplace and as such we are constantly being approached by customers to come up with a cost effective labelling solution for distinct bespoke jobs. Guru Labels boasts a progressive advantage in our finishing department with the implementation of the first GM laser finishing unit in Australia. The GM laser unit delivers exceptional finishing on all Roll2roll jobs but has the added benefit of being able to laser cut labels to almost any shape or size required without incurring additional tooling costs. This very unique service is exclusively available to all Guru Label’s customers.